Sometimes, when you're searching for the perfect reinforcer to convince a dog to drop or otherwise part with a high-value item, you needn't look any further than the item itself. Recently, I was working with a client who was having some difficulty convincing his teething 4-month-old golden retriever to relinquish sticks in the yard once he'd gotten his little jaws around them. Let me preface this by saying that the client has an awesome relationship with the puppy. He's done absolutely everything right; the pup adores him, was clicker-trained from the start, loves training, and is very happy to work for food—except where sticks are concerned. To test this theory, I offered the pup a yummy treat as a trade for the stick. He stopped chewing the stick long enough to eat the treat. But it was clear that the treat was nothing more than a temporary stopping point, and that he would prefer to carry on with his stick-chewing, thank you very much. Consider the attractiveness of a stick: it's a "naughty" item that smells like outdoors, needs to be searched for (fun! ), makes cool sounds, and sometimes breaks into pieces when the pup chomps down on it. Feels pretty good on sore gums, too. Those are powerful reinforcers. Heck, if I were him, I wouldn't want to give it up either! The stick is what the puppy wants more than anything in the world right now. So, never mind the food, let's use a stick to get him to drop the stick. I armed my client (who has really fantastic timing!) with the clicker, instructed him to click the instant he saw the pup let go of the stick, and I put myself on "stick duty." I offered a ho-hum-sized stick to the pup, who, of course, took it with great enthusiasm. Crunch. Crunch. Snap. Chomp-chomp-chomp. ...I grabbed a better stick. And I teased him with it. Ha! "If only you would give up that precious stick of yours, I might share this bigger, crunchier one that I have. Did I mention it comes alive, too?" I waved the stick back and forth in the grass erratically, like a piece of prey. .03 seconds later, the pup spat out Stick #1 (at which point, my client clicked—remember, he has fantastic timing). The pup raced toward the Even Better Stick, which served as the reinforcer for dropping Stick #1. I let him chew on that for a while (literally), and then I darted off to grab Stick #1, which had been cast aside like yesterday's news. I tried the same thing with Stick #1—waved it about like a piece of prey, made silly noises, while running away from the puppy with it (wait, there's chase involved, too?). This time I was able to use a "lesser-value" stick (smaller, wimpier, and already chewed) to reinforce letting go of the Even Better Stick. The pup couldn't wait to let go of his current stick in order to get ahold of the one I was holding. The pup, not wanting to miss out on the cool game over there, spat out the Even Better Stick (click!) and eagerly grabbed onto Stick #1 again. And so it continued, back and forth between the two sticks. Get a click for dropping the stick, then enjoy the other stick as your reinforcer. Each time, the pup couldn't wait to let go of his current stick in order to get ahold of the one I was holding. I let the game go on for just a few minutes (that was plenty to blow his 4-month-old mind!) 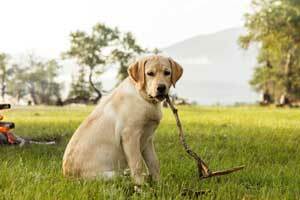 to establish a pattern and change the pup's mindset about letting go of the stick. Letting go of the stick used to mean "game over." It now meant he got something even better. With that new mindset, we were able to switch easily to food as a reinforcer for letting go of the last stick. Using a creative reinforcer (a stick) for letting go of a stick made it a win-win. The pup saw this as: Best. Game. Ever. We saw this is as an opportunity to get what we wanted by making access to a stick contingent on letting go of a stick. Food is often your best option when trying to teach a new behavior, but sometimes it can be useful to think outside the treat pouch. In this case, the pup was telling us in no uncertain terms exactly what he found reinforcing at that moment: sticks. Dogs will always tell us what's reinforcing to them. Dogs will always tell us what's reinforcing to them. We just have to be observant enough to pick up on it, and use that knowledge to our advantage. A key part of being a skilled trainer is being an astute observer of what your animal finds most reinforcing at that moment. What is most reinforcing can vary with time of day, change in environment, and level of stress (for example, dogs that enjoy tug may be uninterested in tugging when they're in a very stressful situation). So it takes thoughtful observation and a willingness to adjust to make sure the reinforcers we're using are always reinforcing. The possibilities for reinforcers are limitless. What we did with the stick was classic Premack Principle: using a higher-probability behavior (stick grabbing) to reinforce a lower-probability behavior (giving up the stick). Tossing bits of the very vegetables I'm chopping as a reinforcer for not begging for vegetables (and waiting outside the kitchen instead). The more you can allow your animal to choose his own reinforcers, the better off you'll be. Let your creativity run wild. The more you can allow your animal to choose his own reinforcers, the better off you'll be. You will get the desirable behaviors you want, while he congratulates himself on the great job he's doing training you! Everybody wins.